ECB President Mario Draghi said he still expected a gradual recovery to begin in the eurozone later this year. The European Central Bank trimmed its forecast for the eurozone economy in 2013, but left interest rates unchanged as expected. It said it still believes that a gradual recovery will begin in the second half of the year. The ECB said it now expects eurozone gross domestic product to contract by 0.6% this year, compared with its March forecast for a contraction of 0.5%. But it revised its forecast for 2014 higher, predicting a return to growth at a rate of 1.1%. It also cut its inflation forecast for 2013 to 1.4%, comfortably within the target of just below 2%. Inflation would ease further to 1.3% in 2014, the central bank said. With the eurozone stuck in recession for six consecutive quarters, the ECB cut its main interest rate to a new record low of 0.5% last month, and said it stood ready to take further measures if necessary to boost activity. ECB President Mario Draghi said Thursday that the bank had decided that not enough had changed since May to warrant further action at this point. 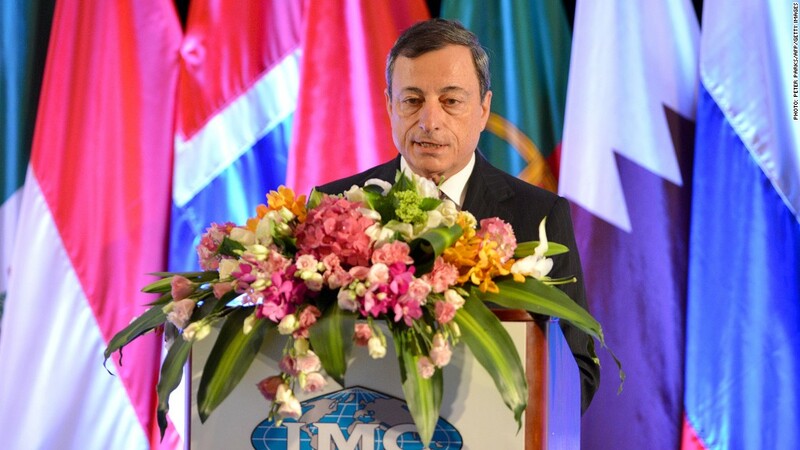 "But we stand ready to act, and we will continue to monitor closely all incoming data," Draghi told reporters. Earlier this week, PMI data showed the downturn in eurozone factories had eased for the first time in four months. And overall business sentiment was slightly stronger than expected in May across services and manufacturing, although the figures still represented a 16th consecutive month of declining activity. The Organization for Economic Co-operation and Development called on the ECB last week to do more to tackle the recession and record unemployment. The OECD said the central bank should take advantage of downward pressure on prices to take bold steps -- such as cutting deposit rates below zero -- or risk contributing to stagnation with negative implications for world growth. Draghi said the ECB was technically ready to introduce negative deposit rates but there could be unintended negative consequences. Negative rates could help ease a credit squeeze by encouraging banks in depressed southern Europe to lend more money to businesses and consumers rather than leaving it on deposit. Earlier, the Bank of England also decided to keep interest rates unchanged and kept the size of its asset purchase program at £375 billion. It was Mervyn King's last meeting as governor before he hands over to Mark Carney, former governor of the Bank of Canada.